Ah, EMTALA! The revered Emergency Medical Treatment and Active Labor Act! It’s one of those things which is like a nursery rhyme to emergency medicine folks like me. We’ve heard about it from the infancy of our training. “And then the bad doctor sent the poor lady to another hospital because she couldn’t pay! And the King came and crucified him for doing it!” The end. EMTALA, for the uninitiated, is a federal law which ensures that we don’t turn people away from the ER because of finances, and also keeps us from transferring people to other hospitals without that hospital’s agreement. It also exists to guarantee that we stabilize them as much as possible before they go. I’ve said before, and always will, it was a good idea. But like many laws, it was subject to the law of unintended consequences. For instance, being forced to see lots and lots of people (who may not really be that sick), and do it for free, has huffed, and puffed and blown the hospital and trauma center down on too many occasions. But that’s not my point here. My point is that when EMTALA forms meet electronic medical records, chaos can ensue. Allow me to illustrate: This is a standard EMTALA form. Check, check, check, sign. It takes a busy physician less than a minute, and the nurses a few more since they have to call the other hospital and record times, etc. This has worked well for a very, very long time. Enter EMR. 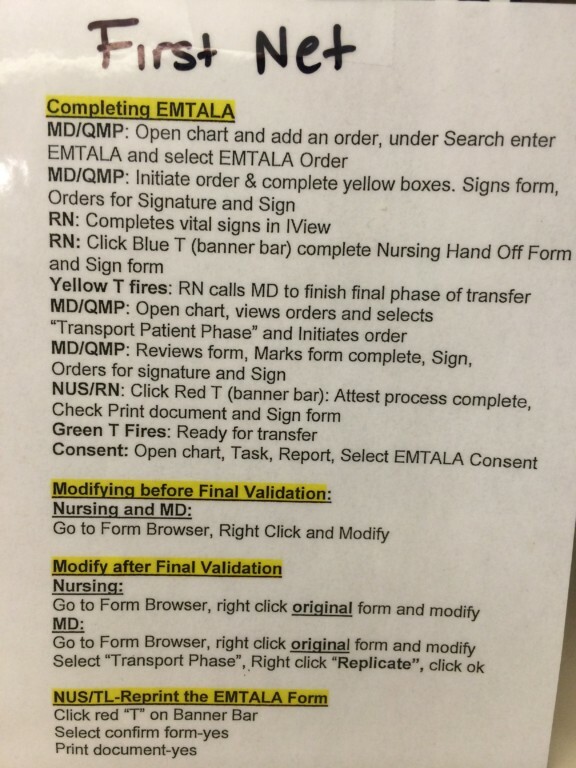 This is the procedure for doing an EMTALA form at Tiny Memorial Hospital, which has been enchanted by the dark Lord Cerner. Mind you, I’m sure the powers that be feel that this is a perfectly wonderful way to do the form. Indeed, it captures lots of information and stores it in the system. But two facts remain: First, the people who designed the system generally work at Large Urban Hospital, which owns Tiny Memorial. They don’t transfer things out very often. They receive things. Second, most of the patients being transferred are going within the system. All the data is on the EMR, and it isn’t as if they’re going to some strange facility far, far away. Not long ago my team worked a cardiac arrest at Tiny Memorial, with a successful return of cardiac activity. Given our size and staffing, it took pretty much all of the staff available, and nothing moved for a while. A helicopter whisked our patient away. 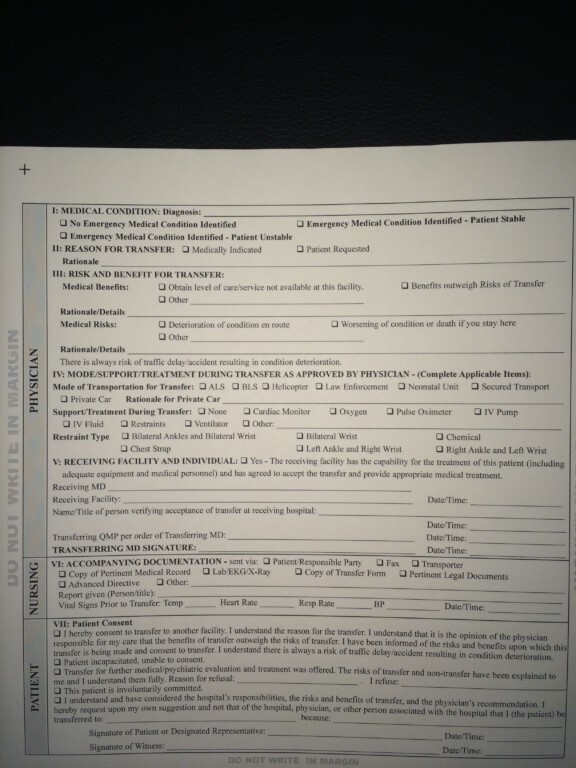 Of all the things we did; drag her out of the car, do CPR, start IV’s, intubate, talk with family, chart, arrange transfer, nothing was as complicated or frustrating as this process to complete the EMTALA form. In the end, I still got it wrong somehow. Mind you, I never violated the spirit of the law in any way. She was treated, stabilized (to the extent of our ability) and sent away to a receiving hospital with the capacity to care for her. I don’t want to impugn the motives of those who developed this. I’m sure they were trying their best. But if you don’t use it, you can’t see how hard it is. And you also can’t see how much time it takes in a place with limited resources and staff. So please, folks, let’s use technology to simplify, not make things more complicated! And let’s remember that charting isn’t the same as doing the right thing. And sometimes, doing the right thing isn’t perfectly reflected in the chart. But paper or electrons, it’s still the right thing. And that’s what EMTALA is about. Edwin Leap is an emergency physician who blogs at edwinleap.com and is the author of the Practice Test and Life in Emergistan. Parents: Interact with your kids!